Typically, accounts with no billing in the last 12 months are set to “inactive” anyway. Note that account personal data 7 years old is erased automatically by our system on its 7th year anniversary, if the account is inactive and does not have a charge in the last 12 months (which is typically the case). Pay Per Scene accounts cannot be self-deleted – contact Customer Support with your request, and it will be addressed promptly. Once an account has had personal information deleted, it’s not possible for Customer Support to assist you in administering this account any more. Discount rejoins cannot be offered. How do I erase my personal details from my account? 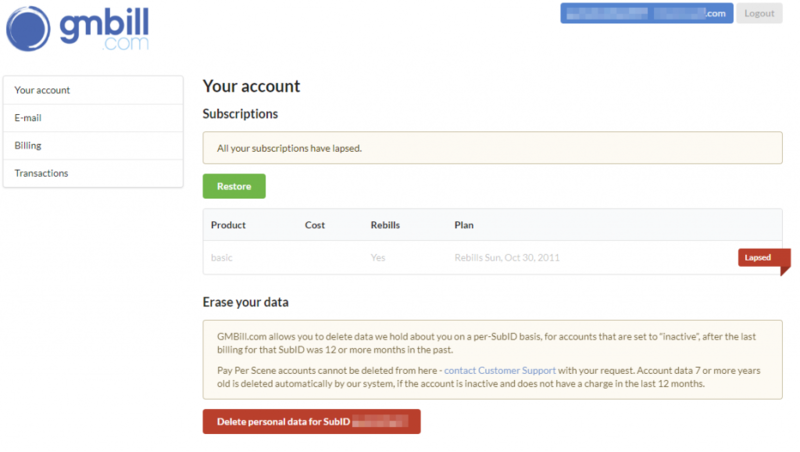 Log in to GMBill, using your username and password (the same one you use for logging in to the site you paid for). 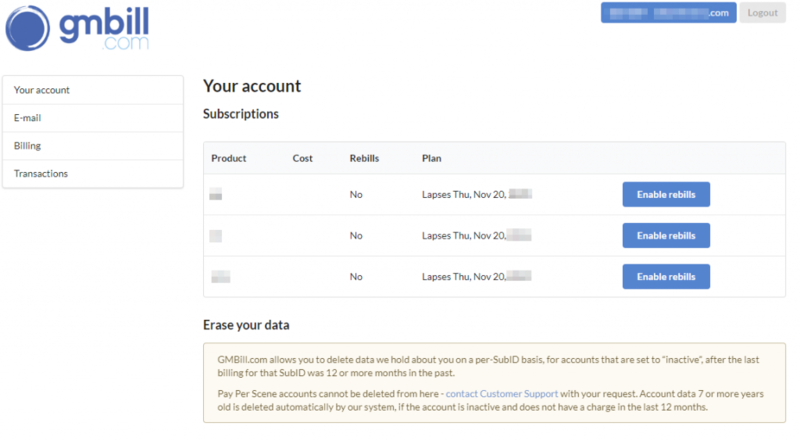 If you have multiple SubID’s with us for the same username and password (for example, a subscription to several different sites, or several subscriptions over time to the same site), you’ll be asked to select a SubID to proceed. On the logged in page, if this account is able to have personal data erased, the “Erase your data” panel will be shown on the Your Account tab. Simply click the red “Delete Personal data for SubID 123456” button, confirm you are certain – this cannot be un-done! – and the personal data will be erased. You will be logged out of GMBill. If you have other SubID’s with data you want to delete, log in and repeat the process for each SubID. ABOVE: This user is not able to erase their personal details yet, as it has not been 12 months since the last change or, the account is still active.